Dozens of representatives from the spheres of science, technology, engineering and maths attended a special reception hosted by President Michael D Higgins at Áras an Uachtaráin. The event was held to acknowledge the special contribution made by citizens who have excelled in science and its application to Irish life. Addressing the guests, President Higgins said the aim was to recognise the positive contribution of science not only in the past but also in the present. "Science is such an important and influential discipline and it is now central to the great issues of our time," the President said. He paid tribute not only to scientists themselves, but also to those who teach it. He also acknowledged the importance of the BT Young Scientist and Technology Exhibition, whose co-founder Dr Tony Scott was in attendance. Speaking about the importance of blue skies research, President Higgins said he very much supported those who signed a public letter some time ago calling for more support for fundamental science, adding that it remains his view. On the issue of getting more women involved in Science Technology Engineering and Maths (STEM), the President said it was important we realise that we need to change a great deal in order for us to have the full benefit of the equal participation of both genders in science and technology applications. However, he went on to acknowledge that we are making great steps forward. Among those in attendance at the event were the Director General of Science Foundation Ireland, Prof Mark Ferguson, the President of Dublin City University, Prof Brian MacCraith, Vice President of Research at UCD Prof Orla Feely and the space scientist Professor Susan McKenna Lawlor. Previous winners of the BT Young Scientist and Technology Exhibition, including this year's winner Shane Curran, were also in attendance. A number of prominent science communicators including comedian and presenter Dara Ó Briain were also there. Every St Patrick's Day, President Higgins and his wife Sabina host an event to celebrate an area of excellence in Irish life, with science being this year's theme. 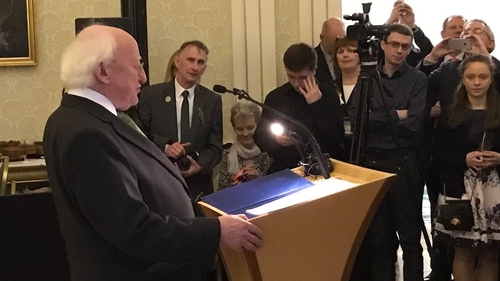 Since his inauguration in 2011, President Higgins has used many occasions to highlight the potential of science and scientific discoveries to find solutions to the world's greatest problems, such as climate change, global hunger and environmental degradation.